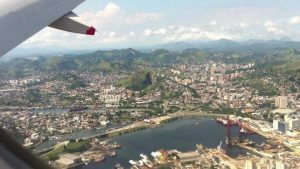 As the plane began its descent into Rio de Janeiro my neighbor finally woke up and looked around sleepily. “Are we there?” she asked me. “Yes, the pilot just made the announcement,” I replied, forcing myself to sound polite. I knew it wasn’t fair, but I had been resenting the woman for having taking the window seat next to me. The doors of the aircraft had just closed and I was happily beginning to stretch out over both seats, assuming I had the entire bench to myself. Since it was still a long trip from Houston to Rio and I had already been on my way for quite some time, I was looking forward to getting some sleep. Just then the flight attendant appeared with a passenger in tow: a breathless and disheveled looking petite middle-aged woman. I couldn’t help but notice her somewhat outdated appearance. She wore baggy pants and an Indian scarf wrapped around her neck: a popular style among us young anti-establishment folks back in the late seventies. But her face was child-like despite its many little wrinkles, and her wide curiously looking eyes gave it an expression of permanent astonishment. It was framed by a mass of long grey and loosely braided hair. She looked like she was embarking for an adventure — not for carnival in Rio, which where I was heading to, but rather for an exploration of the Andes. The flight attended showed her the vacant place next to me and I reluctantly peeled myself out of my aisle seat to let the woman in. She covered herself with a blanket and her jacket, curled up in her seat, and went to sleep. It wasn’t until we approached our destination at dawn when she tried to connect with me. “Is this your first time in Rio? I was so cold all night! Where is the line for US citizens?” But I was too busy getting organized for the arrival with passport and papers, bags, and now obsolete sweaters to engage in a conversation, and I kept my answers brief. Had I known that this was going to be my last fully coherent conversation for a while I might have been slightly friendlier. Not being proficient in Portuguese I struggled my way through the airport, trying to read the signs to the Rideshare pickup location. A nice, but non-English-speaking driver took me to my apartment building. I climbed out of the car and thanked him in English whereupon he replied with a friendly stream of Portuguese. I turned around and was greeted by an efficient doorman. He had been instructed to hand me the keys and show me to my apartment. Assuming I understood his spate of information, he explained how to get in and out of the building, where to dispose the garbage, and many more things which I couldn’t quite grasp. 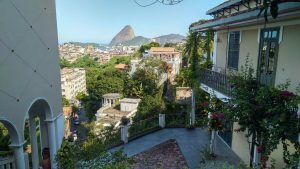 I had chosen to stay in a local neighborhood instead of the bustling touristy areas of Copacabana and Ipanema where speaking foreign languages was part of business. I began to realize that this had perhaps not been the smartest decision, and that communication would be a struggle on every level. Day one of exploring my new neighborhood! I’m thrilled to discover Rio’s iconic Sugar Loaf Mountain in the background! I stumbled through the first and second day in my neighborhood, exploring my new surroundings, trying to read signs and labels, but being unable to utter even the simplest words. Worse, I was unable to establish any meaningful connection with people. My vain efforts in starting small talk were met with a wall of silence, and I inwardly cursed myself for not having made more of an effort to learn a few basic phrases. Silently I went shopping at the little grocery store down the street where the annoyed cashier finally pointed to the screen to show me the amount I had to pay. Silently I went for lunch at a simple local restaurant where the well-meaning waiter served me huge slabs of meat with rice and beans and French fries — we had completely misunderstood each other. And silently I had my morning coffee at the family bakery where everybody around me was engaged in lively conversation. While lots of finger-pointing usually got me what I needed, I felt stupid and insecure and, most of all, isolated. On my third day in Rio I finally met the other members of my travel group. Most of us had come to Brazil from the USA and Australia. We were going to dance with one of the elite samba schools, Império Serrano, at the big carnival parade at Rio’s Sambadrome. I was looking forward to making new friends, to finally having conversations in a mutually spoken language, and to be able to share my experiences. We met in the bustling center of town. The plan was to go shopping for samba shoes. Rio was already crazed by carnival, and there was deafening music blasting from everywhere, making it difficult to talk. Tourists and locals were shoving each other through narrow streets, and it was hard to stay together as a group. Not a good place to get to know a new bunch of people! Soon after purchasing our dance shoes at a tiny hidden samba shoe store, we lost sight of each other. I took a cab and went back home by myself. That same night I got a second chance to meet the group. 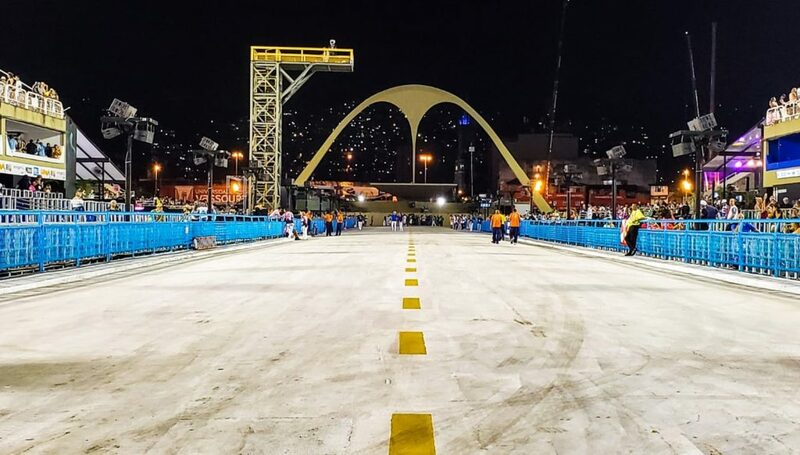 It was Império Serrano’s tech rehearsal at Rio’s Marquês de Sapucaí Sambadrome, an important event in preparation for the dazzling parade. We were to perform along the entire alley, about half-a-mile long, practicing our moves and singing our school’s samba enredo — the song-samba — before an audience of spectators, not as many as at the actual parade one week later, but still a sizeable number of people. ‘There will be a lot of photographers and cameras,’ our organizers messaged as I was getting ready to leave my apartment. It was going to be almost like the real deal. I got excited, put on my school’s T-shirt, my new samba shoes, and did my best to look presentable for the cameras. Let the show begin! The Sambadrome before the dancers hit the floor. We had a designated meeting point in the area where the samba schools gathered just outside the Sambadrome, the great arena which is the home of Rio’s main carnival parades. When I arrived I tried to spot the other members of my group, but I couldn’t make out any of the young women I had met just a few hours before. Hundreds of dancers had already arrived and were divided into their specific alas or wings. I stalked up and down the broad street in my newly purchased glittery samba heels, hoping to recognize some of the faces from earlier that day. WhatsApp messages kept flying back and forth with people apologizing for being stuck in mad traffic, and not finding the meeting spot. Despite the late evening hour, the thermometer still showed 36 degrees Celsius — about 96 degrees Fahrenheit — and I was sweating, to say the least. My desperation grew as I continued not to recognize anyone from my group. My lack of Portuguese prevented me from inquiring of other participants in my samba school, all of whom seemed to be Brazilian. But finally I spotted one of our group’s organizers and followed her as she gathered her sheep. It was no wonder I hadn’t recognized any of them — they all were in full makeup with elaborate hairdos and looked completely different from when we had gone shopping together earlier in the day. At this point our turn for the rehearsal had already been delayed by more than an hour. It was past 9 p.m. and the previous school was still parading down the Sambadrome’s main alley. From outside the arena where we waited, we could hear the music. Our feet began hurting, the heat was getting to us, and we sat down carefully on the curb so as not to dirty our white skirts. I glanced around and noticed passers-by watching us curiously. Then our wing masters started to organize us into our respective sections. I was lined up in one row with perhaps a dozen other dancers. I made a point of memorizing the people next to me so I wouldn’t get lost after the parade. We followed what looked like twenty rows in front of us with many more behind us. Craning my neck I could see I was surrounded by a sea of green-and-white — Império Serrano’s colors — but with no recognizable faces. Waiting… and resting our feet. The batería — the drumming section — started to play, and this was our signal to start moving. The penetrating beat of the drums pushed us forward, and we moved to the music and sang our school’s theme song: ‘O que é? O que é?’ I had done my best to memorize the song, and managed to sing the refrain plus about five of the ten verses. Then I started skipping. I noticed that other dancers in my American/Australian group weren’t doing any better. We could only hope that no one would notice, and that the Brazilian members of the school would make up for us, and that we would be able to cover our lack of singing with some impressive samba moves. But our audience that night was unforgiving. 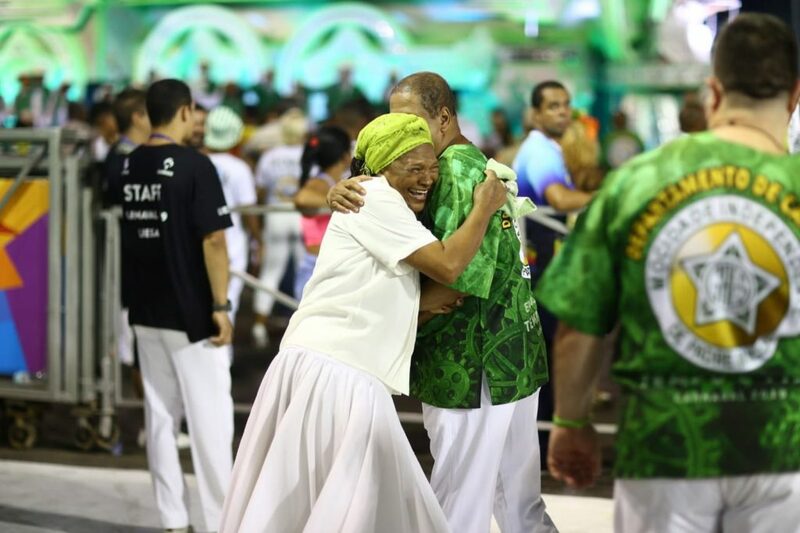 When we turned into the parade alley of the enormous stadium, thousands of spectators awaited expectantly and most of them seemed to be true bambas, experts in all things samba. Given the fervor and conviction with which they sang our song-samba I assumed that they came from the neighborhoods where samba had its roots, but where people couldn’t afford the stiff ticket prices for the actual parades. Instead, they flocked to the school’s technical rehearsals which are free of charge. When they spotted us skipping some of the lyrics, some of them shook their heads and pointed at us disapprovingly. I felt guilty and embarrassed and tried my best to keep up with the fast beat of the music. It drove me forward, and as I kept singing and dancing I didn’t notice my body getting tired. I could see the big arch at the end of the arena coming closer, but it seemed to be taking an eternity to get there. I was hot, my feet were hurting, my throat became dry, but I kept singing and moving and let myself be carried away by the driving rhythm. We had just reached the crossing in the middle of the arena when I glimpsed a familiar face at the barrier which separated the audience from the performers. I didn’t immediately realize what had happened. But as I turned again slightly to my left there it was: a child-like face with wide eyes, staring at us with a stunned and astonished look, and a mouth open with a happy smile. There was no doubt about it — it was my seat neighbor from the plane! What was she doing here? She was not in the Andes, neither was she embarked on an adventure such as documenting life in the favelas — the poor neighborhoods where many in the audience were from. No, she was right here at the Sambadrome, watching our carnival rehearsal! Did she recognize me? Probably not. Just like everybody else my face was painted with make-up, I was wearing a false braid, and I didn’t look or act at all like the person she had met on the plane. I had turned into a stage persona. Should I expose myself? Would she recognize me? What would she think? I was divided between the joy of the unexpected encounter and maintaining my cover. Before I could decide a strong voice called me to order in Portuguese. I didn’t need to understand the words. Not having been paying attention I was now dancing out of line and was disrupting the harmony of my section. I rejoined the line again in a hurry, apologizing to our wing master, and continued dancing and singing until the end. When we finally reached the Sambadrome’s arch marking the end of the parade, I turned around. But all I could see was a distant mass of faces. So what’s with the bandoneon? andrea on So what’s with the bandoneon?